We mentioned yesterday morning that we saw the S&P 500 (NYSEARCA:SPY) go from a downtrend to an uptrend late last week and expected the trend to be a good sign for earnings season. With another up open today it's one more tick of confirmation. The lack of bad news is good news. As we said and want to reiterate, macro took the market down but bottoms-up fundamentals can take the market higher now that we're in earnings season. 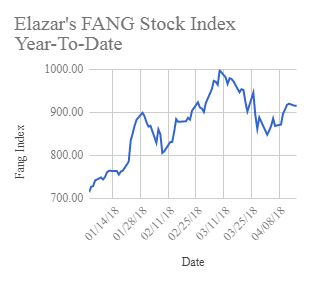 As for our FANG Stock Index we also pointed out that the chart looked fine. Nothing was wrong with that chart meaning it should have no problem making new highs at some point soon. Netflix (NASDAQ:NFLX) is helping today. We have a $650 price target on Netflix. It's a good sign that Netflix, a FANG stock and a tech heavyweight had a good report and a good reaction. We want to see Netflix close higher than it opens today as an extra strong sign for future reactions of earnings reports in the coming earnings season. As a quick recap our FANG Stock Index was down .6% yesterday but up 32.6% year-to-date. That's versus the SPY up .2% YTD, the NASDAQ (NASDAQ:QQQ) up 4.4% YTD, and the Semi index (NYSEARCA:SMH) up 6.4% YTD. Today's going to get these indexes higher again. I do hopefully see new highs at some point in the next month or two. There will surely be some macro scares so there is no straight line. We'll continue to assess and the main factors to watch are the fundamentals and market trend. We are more bullish on tech in the second half as iPhone drives the food chain but ex-mobile the rest of tech should be strong. Have a great day of investing.